As far as I know not much has been done on the etymology of Kurdish vocabulary. This is a preliminary attempt to start a modest basis in the absence of etymological references. However, since Kurdish belongs to the Iranian group of Indo-European family of languages European, Sanskrit and Iranian sources could be useful in addition to personal experience. Cultural and geographical aspects or extra-linguistic factors prove to be indispensible. Consequently, the words listed here need more research and discussion and ideas are welcome. Some words have been included without any etymological attempt. Kurdish has been neglected so far due to its sad history and for being a nation without borders and international identity on the one hand and because of being punctured by borders of those countries which have annexed large parts of its territory. Kurdish was often put on the list of languages facing extinction. Starting with the vocabulary related to women is a top priority as Kurdish women have suffered doubly from discrimination by the Kurdish patriarchal society and Kurdish enemies. 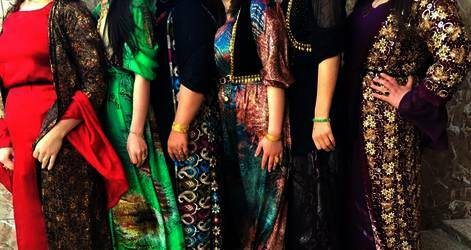 Some claim that Kurdish women enjoy more freedom in comparison with women from other Middle Eastern countries. This might be true to a certain extent. However, linguistic data available and practices show a totally different picture. This is the reason why their faces are made invisible here in the picture. Since most Kurds used to live from cattle particularly sheep mar مه ر and goats bizn بزن and the Kurdish Shwaan شوان shepherd with his ferocious shepherd’s dog was central and a source of inspiration for songs and poetry, milk shir شیر / do دو (a kind of sour milk) play an important role in language whether in words referring to women as daaya دایه mother/nurse, mamk مه مک woman´s breast and maamaan مامان midwife or a woman who takes care of children or words which express emotions such as insults kar-shir که ر شیر one who was raised with the donkey’s milk. Kurds are famous for their high quality milk products such as maastaawماستاو (a drink made of yoghurt and water flavored with salt, mast ماست yoghurt, panir په نیر cheese. Mamk مه مه - مه مک woman’s breast probably cognate with English mamal. The suffix k in mamk is Iranian. The word mé می which means female is possibly related. Pilk پلک aunt. This word seems to be of Iranian origin which reflects its importance in comparison with (Maamozhinماموژن paternal uncle`s wife) and (Xaalozhin maternal uncle`s wife(خالو ژن which are compounds of an Arabic word entered via Islam plus the Kurdish word for woman zhin ژن. This means that on the one hand Kurdish women are identified by their husbands only and that the Kurdish extended family in contrast to the nuclear family lost much of its importance in a way similar to English. All words which refer to a nuclear family in English are Germanic such as mother, father, daughter, son, sister and brother but the once you go to the members of the extended family such as aunt, uncle, niece, nephew, cousin you switch to Romance.